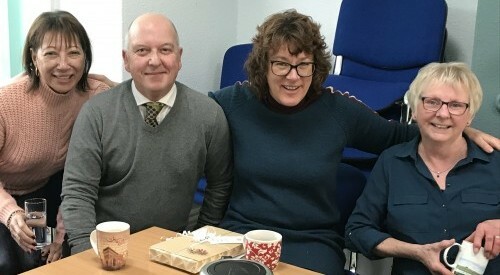 Helen has been the Catholic Care development worker on a 2 year pilot project called Embrace which worked in the Keighley and Skipton Deanery. Working with Caritas Diocese of Salford and Hudsons Care from the Arch Diocese of Birmingham, the project addressed the issues of isolation and loneliness in older people with a particular reference to Parish life. Helen’s role was to facilitate Parish communities to connect and support those people in need. Helen has been nothing short of creative when engaging with parishes. One of the intergenerational projects she instigated which connected an older people’s afternoon tea group with Holy Family Catholic High School in Keighley, culminated in a film called Making Memories where the older and younger members of the groups shared their experiences and ultimately became great friends. The film, which captured this great experience and included a trip down memory lane in Keighley, was premiered in Keighley Picture House on 9th November 2018. As the project comes to an end we want to thank Helen for all she achieved and wish her well with her future adventures.